account balances and other vendor-to-customer relationship information on your business system via the Internet. 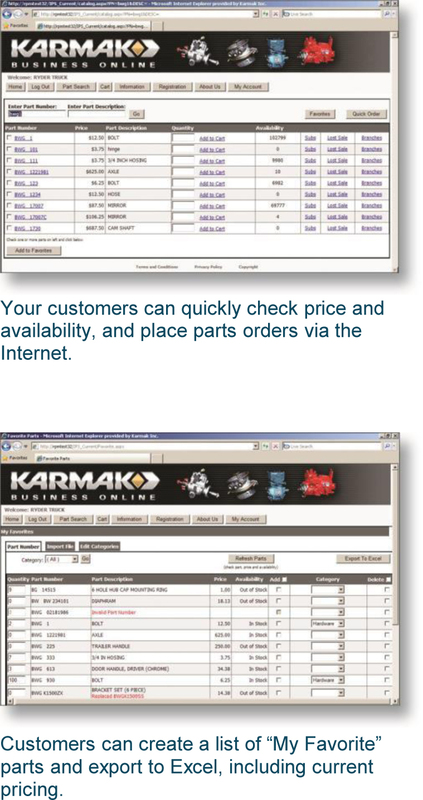 It makes purchasing parts and looking up parts pricing and availability as easy as surfing the Web. your customers will receive on-screen and email confirmation of their orders. 24/7 Account Information: Business Online account holders can log in around the clock to see their account information such as recent purchases, order status, backorder status, customer core right-to-return, account balance, amount due (30, 60, 90 days), service history and more. representatives can see when customers are searching (but not purchasing) inventory, prompting sales calls and possible price revisions. Display Company Logo, Part Images and Documents: Business Online allows you to customize your retail site with your company logo and other images. Part images and documents may be attached to part numbers and can be viewed by your customers.